The summer is here. A scent of burnt wood and coal embraces the villages when locals and home comers gather for BBQ on the lawns. Vacation is on everyone’s mind and people are preparing for beach days and swimming, trailers are being cleaned and the mosquito nets are put into place. The silence in our green municipalities is replaced by happenings and family days when the highlights of the summer begin – the markets. 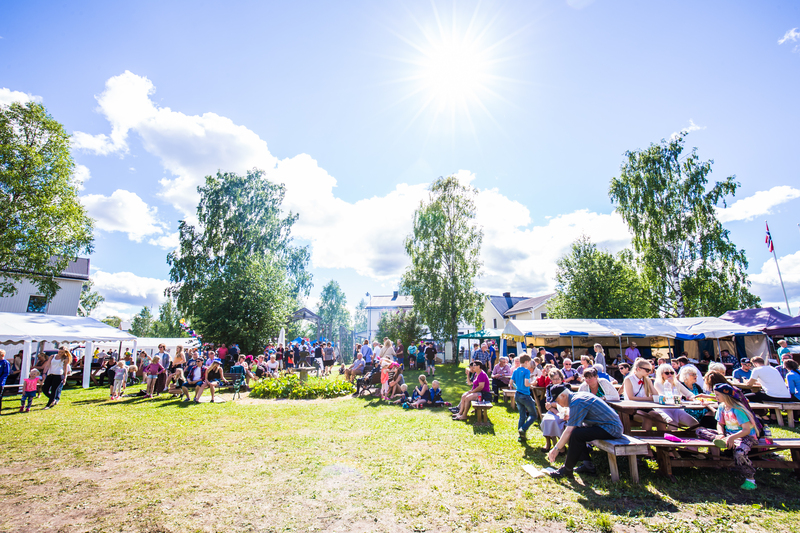 Mark your calendar and experience this summer’s markets in Heart of Lapland. July 6-8, 2018, open 10am–5pm every day. The market in Pajala dates back to the 1700s and is today Norrbotten County’s largest market with around 45,000 visitors each year. 300 street vendors gather here over a weekend and together offers a huge selection. You can find everything from candy to clothes and art, local handicrafts and international delicacies. A carnival area with carousels, lotteries and contests is perfect for families and when evening comes, the adults gather for dancing, concerts and other happenings. Welcome to Pajala Marknad. Övertorneå’s summer market is called Matarengi Market after the town’s Finnish name and dates back to 1979. During three weekend days, the main street is closed off and street vendors set up their booths. Here you can shop candy, clothes, handicrafts and mingle with local politicians. Many of the stores offer discounts and along the street you’ll find a café where you can rest and have a cup of coffee. In the middle of it all you can enjoy interviews and live music on the main stage, often performed by local and regional go-getters and talents. Take part in the local community during Matarengi Marknad. July 13-15, 2018, open 10am–5pm every day. During the third weekend of July, the big festival Överkalix Marknad takes place. You can participate in exciting activities and events in the surrounding villages and the town itself during the entire week leading up to the market. Överkalix Marknad has something for everyone – enjoy dancing, music, competitions and the carnival or what about the marketing run and evening entertainment? The market hits record numbers each year, counting visitors and almost 40 000 people visited last year. Enjoy Överkalix Marknad! July 12, 2018, open 11am–5pm. The markets in Hedenäset dates back to the Middle Ages. Here you can find quality and locally produced products. Hedenäset/ Hietaniemi Sommarmarknad has something for everyone, a running competition for children, singalong and lotteries- just to mention a few. A market located at the beautiful Älvbacken in Överkalix. Here you can find locally produced handicraft, food and yarn.This is the second year the market is open after last year’s success. Mat- & hantverksmarknaden is a part of Hantverksveckan in Överkalix.